To effectively manage the resources within the sanctuary, scientists must understand the natural and cultural resources and the threats they face. Site characterization describes the biodiversity, habitats, populations, communities, and ecological processes in the sanctuary. Site characterization can also include the history of the site, effects of human activities on natural systems and socioeconomic information. Click here to find out more about Site Characterization throughout the National Marine Sanctuary System. The projects below include some of the foundational projects that helped initially describe the sanctuary, as well as more recent activities. Cordell Bank National Marine Sanctuary (CBNMS) completed a successful research mission using a ROV August 18-25, 2014. The team visited one of the most significant features of the sanctuary, Cordell Bank, to conduct a characterization of the invertebrate community on the shallowest parts of the bank, using the sanctuary-owned Phantom ROV and RV Fulmar. In seven days of field operations, the team completed 17 transects, collected over 2000 still images, and nearly 20 hours of video. The data collected was analyzed by CBNMS and a report is available here. This detailed characterization of Cordell Bank’s benthic community provides a baseline for future comparative studies and will allow sanctuary researchers and managers to detect large changes in species abundance and composition driven by natural or anthropogenic causes. Check out this "story map" that provides an overview of conducting ROV field work at Cordell Bank. Staff members from Cordell Bank National Marine Sanctuary, Gulf of the (now "Greater") Farallones National Marine Sanctuary, and other scientists completed a remotely-operated vehicle cruise September 2 - 7, 2014. This cruise focused on the then-proposed expansion areas of Cordell Bank and Gulf of the Farallones national marine sanctuaries, characterizing seafloor habitats near Bodega Canyon in an area some call, "The Football." Staff members from NOAA's National Centers for Coastal Ocean Science (NCCOS), U.S. Geological Survey (USGS), and California Academy of Sciences (CAS) teamed up with the sanctuary staff members to explore features up to 300 meters deep. The team completed 20 transects in each of the target areas ove six days of diving. Sponges and sea whip corals were observed, and many anemones, rock prawns, rockfish and flatfish were seen. Predictive models for corals and rockfish were validated through these surveys. A catshark and skate nursery was discovered at "The Football," with several "nests" and hundreds of eggs on the seafloor. Collections were made of the sea whips, shark eggs, cup corals, and other specimens, which were analyzed and catalogued at CAS and NCCOS. Gary William, coral expert at CAS and participant in the cruise, identified one specimen as a new coral species. A site characterization report, including maps, observations, images, and counts of animals at these sites, is available here. In addition, a wealth of still images and high definition video for use in education and outreach was captured. CBNMS deployed a Noise Reference Station (NRS) acoustic buoy in the sanctuary in 2015 to record the underwater ambient soundscape. The project is a partnership between CBNMS and NOAA’s Pacific Marine Environmental Lab (PMEL) and adds a node to NOAA’s Noise Recording Stations (NRS) network. This buoy is the 11th NRS buoy deployed by PMEL and the fourth one in a national marine sanctuary. The data will allow CBNMS to characterize the local soundscape, understand how ambient sound varies over time in CBNMS, and analyze how it compares to other reference sites. CBNMS is a feeding ground for endangered whales and this area is overlapped by shipping lanes heavily trafficked by large commercial vessels. Characterizing the ambient soundscape, including biological and anthropogenic noise, is a first step towards understanding the impact that sound has on sanctuary resources. The instruments will record underwater sound for 2 years before the buoy is recovered and the data are analyzed. Funding was provided by the International Fund for Animal Welfare, PMEL, and CBNMS. Check out this short video highlighting this project here. As the result of a partnership with joint climate change working group of the Gulf of the Farallones and Cordell Bank national marine sanctuaries' advisory councils, and with approval of the advisory councils, a comprehensive scoping document was completed. It offers the best available knowledge on observed and predicted physical and biological impacts from climate change in north-central California coastal waters (Point Arena to Año Nuevo), which includes Cordell Bank and Gulf of the (now "Greater") Farallones National Marine Sanctuaries. Over 25 subject area experts from various institutions contributed to the report. The impacts report will provide a foundation to guide development and prioritization of research and monitoring activities that will ultimately inform future policy actions. The climate change impacts report is the precursor and companion to the climate change action plans that will be developed for each sanctuary. These plans will identify priority management actions that will be taken over the next 10 years to address the impacts of climate change specific to the sanctuary site, its communities, and the region. Largier, J.L., B.S. Cheng, and K.D. Higgason, editors. 2010. 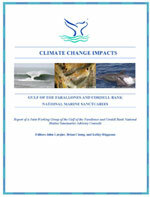 Climate Change Impacts: Gulf of the Farallones and Cordell Bank National Marine Sanctuaries. Report of a Joint Working Group of the Gulf of the Farallones and Cordell Bank National Marine Sanctuaries Advisory Councils. 121pp. A team of technical divers from the Bay Area Underwater Explorers (BAUE), a non-profit organization dedicated to the conservation and exploration of underwater areas in Northern California, has completed three years of diving and documentation at Cordell Bank. BAUE took their first look at Cordell Bank in 2013 after a year of planning and returned to Cordell Bank in 2014 and 2016, revisiting two sites (Northeast Ridge and Northwest Ridge) each year. Cordell Bank’s deep depths, complex topography, strong currents and offshore location require highly experienced and skilled technical divers. The BAUE team used advanced diving techniques that allow divers to reach depths up to 300 feet using a combination of open-circuit scuba equipment and mixed gas. BAUE has collected hundreds of high definition images and produced video segments that they have generously shared with Cordell Bank National Marine Sanctuary (CBNMS). CBNMS has used the imagery in a variety of education and outreach products and has completed a qualitative analysis comparing species composition from the two dive sites across the years. The two dive sites BAUE visited were first surveyed in 1981 by Cordell Expeditions and again in 2010 by NOAA technical divers. This time span of imagery may allow sanctuary researchers and managers to detect large changes in species composition driven by natural or anthropogenic causes. BAUE’s efforts are helping the sanctuary see how the bank may be changing over time and BAUE and CBNMS are working together to develop new techniques to collect more data and imagery on the bank. CBNMS issued a permit for the project and provided guidance on dive sites and looks forward to continuing to work with BAUE. More than 3,000 underwater color photographs (35mm transparencies) of Cordell Bank taken between 1977 and 1986 by SCUBA divers from the independent research group Cordell Expeditions were donated in 2010 to the California Academy of Sciences (CAS) in San Francisco. The photographs complement the collection of biological specimens collected by Cordell Expeditions that have been curated at CAS. California Academy of Sciences research staff has digitally scanned all of the images and posted over 350 images online through CalPhotos. Explorations for deep-sea coral and sponge (DSC) communities using a remotely operated vehicle (ROV) and autonomous underwater vehicle (AUV) have provided new information and the deepest images ever taken of Cordell Bank National Marine Sanctuary (CBNMS). Information on the presence, abundance, and habitat associations of deep-water sensitive species, such as corals and sponges, and their associated communities improves our ability to protect these unique and biologically diverse communities from anthropogenic disturbances. Observations suggest that corals and sponges are providing important habitat for fishes, including rockfish. Evidence of fishing disturbance was observed during this research, which highlights the potential impacts to these fragile deep-water communities. Exploration in 2010 used a ROV to characterize DSC assemblages on the continental slope west of Cordell Bank. Exploration in 2011 utilized an AUV to survey DSC in Bodega Canyon, north of Cordell Bank. 1. 2010 R/V McArthurII ROV cruise report. 2. Graiff, K., D. Roberts, D. Howard, P. Etnoyer, G. Cochrane, J. Hyland, and J. Roletto. 2011. A characterization of deep-sea coral and sponge communities on the continental slope west of Cordell Bank, Northern California using a remotely operated vehicle. Final report to NOAA Deep Sea Coral Research and Technology Program. 21pp. Graiff, K., D. Roberts, and D. Howard. 2011. A first look at deep-sea corals and sponges on the continental slope west of Cordell Bank, California. Western Society of Naturalists, Vancouver, WA. In 2010, a technical dive team from NOAA's National Marine Sanctuaries and the Cooperative Institute for Ocean Exploration, Research and Technology (CIOERT) completed a series of deep dives in rigorous conditions on Cordell Bank. The team completed a series of dives down to 190 feet in strong current. This was the first dive expedition to Cordell Bank since Cordell Expedition divers explored the Bank between 1977 and 1985. Divers returned to the boat astonished at the pristine nature and spectacular diversity of life covering the Bank's upper reef areas. The team was able to accomplish all the mission's science objectives including photo and video documentation and sample collection of invertebrates. This information will allow sanctuary staff to evaluate changes that have occurred on the bank since the original survey 30 years ago, and establish species composition and reef conditions in 2010. The 2010 data will allow sanctuary staff to analyze future changes that may be associated with climate, in particular effects of ocean acidification on deep corals. 2010 R/V Fulmar SCUBA cruise report. Re-discovering Cordell Bank: Dive expedition 30 years later. Graiff, K., D. Howard, and B. Van Syoc. 2011. Re-discovering Cordell Bank: Technical dive expedition 30 years later. Beyond the Golden Gate Research Symposium, San Francisco, CA. . The Cordell Bank Species List is a comprehensive database of all species documented within the Cordell Bank National Marine Sanctuary. For any new observations of birds, marine mammals, fishes, invertebrates and algae observed in the sanctuary, the species list will be updated. Taxonomic classifications have been verified against the World Register of Marine Species (WoRMS). Additional collection, identification, and confidence details for each species are also available in the complete sanctuary database, including 1,230 specimens cataloged at the California Academy of Science's Department of Invertebrate Zoology and Geology. The Cordell Bank National Marine Sanctuary Condition Report provides a summary of resources in the sanctuary, pressures on those resources, the current condition and trends, and management responses to the pressures that threaten the integrity of the marine environment. Specifically, the report includes information on the status and trends of water quality, habitat, living resources and maritime archaeological resources and the human activities that affect them. Condition reports are being written for all of the national marine sanctuaries in the United States. Office of National Marine Sanctuaries 2009. Cordell Bank National Marine Sanctuary Condition Report 2009. U.S. Department of Commerce, National Oceanic and Atmospheric Administration, Office of National Marine Sanctuaries, Silver Spring, MD. 58 pp. High resolution backscatter and bathymetry data have been collected on Cordell Bank and the deeper continental slope areas north and west of the bank. Habitat characteristics such as slope, rugosity, depth, and substrate type are being used to describe the physical habitats that make up CBNMS and to relate these seafloor features to benthic community patterns. Seafloor mapping of Cordell Bank was conducted by California State University-Monterey Bay. Click here to download data. Seafloor mapping of the continental slope of CBNMS and surrounding areas was conducted by NOAA Office of Ocean Exploration and Research aboard the NOAA ship Okeanos Explorer. A marine biogeographic assessment was conducted by the National Center for Coastal Ocean Science (NCCOS) to support the 2008 management plan and regulations update for three national marine sanctuaries off north/central California - Cordell Bank, Gulf of the (now "Greater") Farallones, and Monterey Bay. The goal of the assessment was to identify and gather the best available data and information to characterize and identify important biological areas and time periods within the study area. NOAA National Centers for Coastal Ocean Science (NCCOS) 2007. A Biogeographic Assessment off North/Central California: In Support of the National Marine Sanctuaries of Cordell Bank, Gulf of the Farallones and Monterey Bay. Phase II - Environmental Setting and Update to Marine Birds and Mammals. Prepared by NCCOS's Biogeography Branch, R.G. Ford Consulting Co. and Oikonos Ecosystem Knowledge, in cooperation with the National Marine Sanctuary Program. Silver Spring, MD. NOAA Technical Memorandum NOS NCCOS 40. 240 pp. Since 2002, Cordell Bank National Marine Sanctuary has been conducting a long term study to classify habitats and monitor fishes and invertebrates on and around Cordell Bank. Underwater surveys of macrofauna and habitats are conducted using direct observation and video transects from an occupied submersible (Delta). Initially, the data has provided Cordell Bank National Marine Sanctuary with a species inventory of fishes and benthic invertebrates associated with the bank. Analyses to date have examined fish-habitat relationships as well as the role of structure-forming invertebrates as habitat for fish in the region of the bank. Long term data will be used to evaluate change in population characteristics over time, including changes in response to various habitat protection measures and fishery closures. Currently, data are available for 2002-2005 and plans are underway to reinstate this monitoring program. Anderson, T.J., D.A. Roberts, and D. Howard. 2005. Deep-water groundfishes of Cordell Bank: the establishment of a baseline monitoring program. IMPAC Marine Protected Area Conference, Geelong, Australia. Roberts, D.A., T.J. Anderson, and D. Howard. 2004. Fish-habitat relationships at Cordell Bank (California) National Marine Sanctuary. Western Groundfish Conference, Victoria, British Columbia. Pirtle, J.L. 2005. Habitat-based assessment of structure-forming megafaunal invertebrates and fishes on Cordell Bank, California. M.S. Thesis, Washington State University. 64 pp. Cordell Bank video at NOAA Library. As part of the Joint Management Plan Review process completed in 2008, a need was identified for background information on fishing activities within Gulf of the (now "Greater") Farallones and Cordell Bank national marine sanctuaries. This report profiles both the historic fisheries, and the evolution of fishing activities occurring in the sanctuary. The profile completed by Ecotrust includes information on numbers of boats actively engaged in each fishery; areas where the fishery is taking place; gear types; catch levels; a socio-economic profile of the harbors and marinas adjacent to the sanctuary; and an understanding of markets, changing gear types, and changing fisheries management regulations that influence this profile and the community. Information exchange with mariners provided important input to the profile. Scholz, A., C. Steinback, S. Klain, and A. Boone. 2005. Socioeconomic profile of fishing activities and communities associated with the Gulf of the Farallones and Cordell Bank National Marine Sanctuaries. 122 pp. A large portion of the Cordell Bank National Marine Sanctuary is composed of soft mud and sand habitats. In 2004 and 2007, underwater video was collected using a towed camera sledto characterize the soft bottom habitats and biological communities in the sanctuary. Video collected from the camera sled also contributed to groundtruthing sanctuary seafloor habitats that were mapped using side-scan sonar.